When I go on holiday, I like to go and look at some weird stuff. Luckily, the capital city of Italy offers ample opportunity. My first port of call was the Capuchin Museum and Crypt. In a quieter part of the city with a small admission fee, the museum explains the history of the Capuchin monks and their charitable work around the world. Cappuccino coffee is named after the colour of their robes (so now you know). 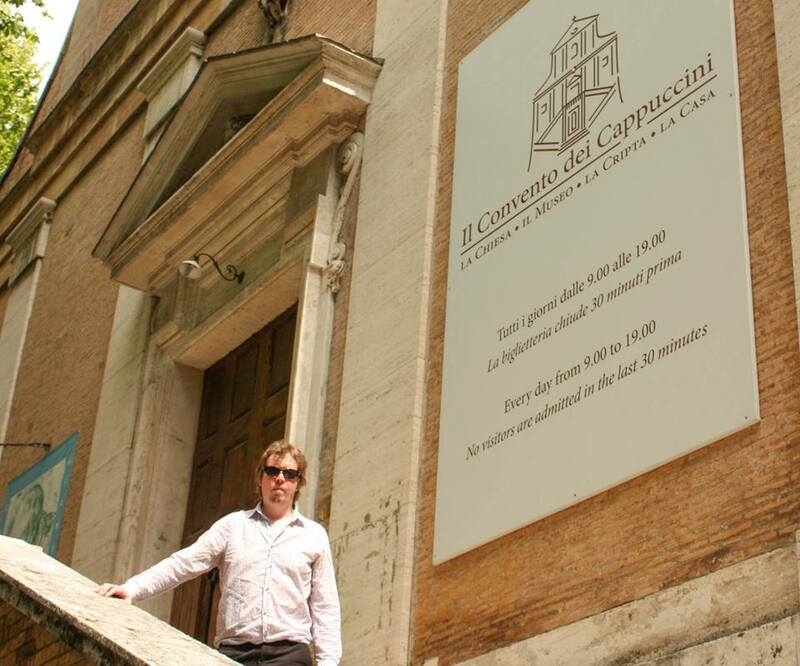 The exhibits include everything from a flagellant’s whip to a Caravaggio painting. Descending downstairs to the crypt, in the footsteps of the Marquis de Sade no less, the place gets decidedly more peculiar; in the depths are several small chapels decorated with the bones of over 4,000 monks. Even the lightshades are made of monk. Looking a little bit like a set from a 1970s Hammer Horror film, the bone-coated chapels are alarming, baffling and surprisingly warm. However, the shrines are meant to reinforce the transient nature of physical existence, rather than scare the beejesus out of anyone, and they are endorsed by the Catholic church (if that counts for anything). Regrettably, the museum does not allow its visitors to take photographs of the interior. The no-photo regulation is to preserve the exhibits, I imagine, but it was actually quite refreshing to visit a tourist attraction that didn’t have crowds of people assaulting it with cameras. If you’re curious, there are plenty of photos and videos already on the web. 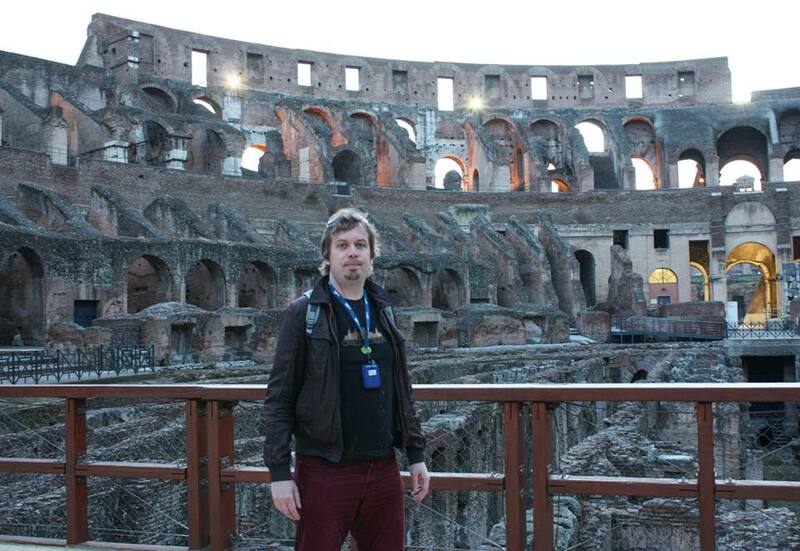 Venturing back on to Rome’s more well-beaten tourist track, my companion and I took a tour of the Colosseum by night. Alhough expensive, we found it worth every euro: Our Italian guide, Gabriel, was passionate about the history of Rome and led us through several other ancient sites on the way, including the Forum, which is almost as impressive as the mighty amphitheatre itself. Just as the sun began to sink, our small party entered the destination with a quiet and reverential excitement. We wandered out in to the vast arena, gaping around with a collective wow! Apparently, exploring the Colosseum after all the daytime crowds have gone is worth the fee alone, but Gabriel was allowed to take us below the arena, where the animals, slaves, gladiators, et al would have awaited their doom, hundreds of years ago. He asked us to imagine the horror and the suffering; the blood and the sweat and the excrement. My fellow tourists were noticeably appalled. I loved it. If you want weird Rome, it’s hard to beat the insanity that is the Vatican. A separate state in itself, the scale of the Pope’s gaff has to be seen to be believed. It’s hard to take it all in as you’re herded through the various chambers and chapels like cattle, gawking at each vast Michelangelo and Raphael fresco before being pushed on to the next (up close, the painting is a bit ropey in places, maybe that’s why you’re not allowed to look at it for long). In the Sistine chapel, talking is not allowed and I was amused to watch the little Italian guards reprimanding those who found shutting up for a few minutes too much of a challenge. To me, it seemed like a heck of a lot of fuss over some bloke named Jesus but perhaps I’m being flippant. I urge you to go see these sights for yourself if you don’t mind taking your life in to your hands every time you cross the road. I have some very special blogs in the pipeline so watch this space! world of wolfson Blog at WordPress.com.